The evening, held on Thursday 12 May, celebrated the successes of the School of Applied Sciences and the School’s vision to be a student-focused academic centre of excellence for industry professionals, students and the local community. There was also an opportunity for networking and discussion at a cheese and wine reception. On the evening, attendees where given a special treat as guest speaker Ben Goldacre delivered a public lecture ‘Bad Science, Wrong Numbers’. He also presented a "greatest hits" of scientists and people misusing statistics in interesting ways. 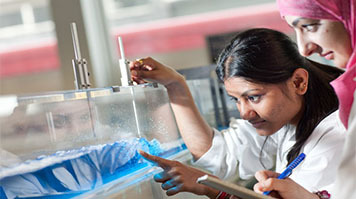 Professor Raymond Lee said: “LSBU’s School of Applied Sciences provides students with a diverse range of innovative courses and sophisticated laboratories to help prepare them for the workplace. “This evening celebrates our achievement, and kick starts a series of professorial lectures which showcase the great work happening within the School and our latest knowledge in the forefront of our disciplines. Ben Goldacre said: "The best universities reach out beyond their core activities, to speak about research with the wider community. It's great to be part of LSBU doing just that!" To learn more about the School of Applied Sciences please visit the website.